When you arrive at Applewatch with the diary in hand, expecting to see Lucien Lachance, you will instead be met by Arquen and the macabre sight of Lucien's tormented corpse dangling from the ceiling. Arquen will fill you in on what she believes is the truth about the traitor: "Silencer! At last you've arrived! 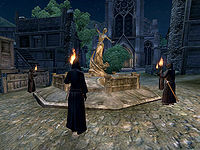 Fear not, for the crisis that has threatened the Dark Brotherhood has finally come to an end. I am Arquen, Speaker for the Black Hand. As you can see, we have dealt with the betrayer, Lucien Lachance! No longer will you serve as his puppet! 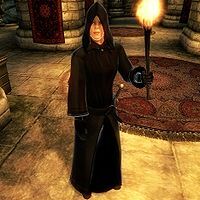 It seems Lachance wanted revenge against the Dark Brotherhood for some reason, and used you to do his dirty work. But now, we can begin anew! I bestow upon you the title of Speaker. You will take Lucien Lachance's place on the Black Hand! Welcome! As you know, the Black Hand is now in a state of disarray. Lachance ordered you to kill us off! We five, including you, are now all that remain. Even worse, you killed the Listener! The Black Hand without a Listener is like a hand with no thumb. Even the Listener's successor is dead! So, we have no choice but to invoke an ancient ritual. We must wake the Night Mother from her slumber, and seek her guidance! Between the hours of midnight and 3:00 AM, ask me about the Night Mother, and we will away to our Lady's home. Only then will the ritual begin." When asked about Lucien Lachance, she will say: "When we confronted Lachance he tried to defend himself, tried to declare his innocence! But we would not hear his treacherous lies! As you can see, he was no match for the combined power of the Black Hand, even weakened as we are." If you ask her about rumors, she will neglect you with: "This is no time for gossip mongering. A dark destiny awaits us." When you exit conversation, Arquen will finish with: "May the Night Mother hold you in her cold embrace." She will then wait for you to approach her again, without ever eating or sleeping. Once you approach her, she will expectantly say: "Dear Speaker, when darkness shrouds the Empire, we can travel to the resting place of the Night Mother, and begin the ritual of awakening." If you ask her about the Night Mother during the day, she will repeat her orders: "You must understand our need for darkness and secrecy? Speak to me only between the hours of midnight and 3:00 AM, and we will be off." If asked about the Night Mother between midnight and 3am, she will instead ask you a question: "The Night Mother must be awakened, so that we may seek her guidance. Are you ready to travel now to her resting place?" If you say 'no' she will give you some extra time to prepare: "All right, but don't tarry too long. Until we receive the Night Mother's guidance, the Dark Brotherhood will remain in disarray." When you accept, she say: "Very good! And so it begins, the Black Hand's journey into a darkness few can imagine. Let us be off! The Night Mother awaits!" Finally, Mathieu Bellamont draws his dagger and kills every Black Hand member but Arquen, who will draw her own dagger and fight back with the words: "What treachery? The traitor still lives! It is Mathieu Bellamont! Do not let him harm the Night Mother! Kill him!" After you have slain Bellamont, Arquen will comment: "Now is not the time for us to speak! We must hear the words of the Night Mother! She will guide us in this hour of despair!" After being promoted to Listener by the Night Mother, you are free to loot the crypt. If you approach Arquen at this point she will simply say: "The Night Mother wishes for you to take some time to consider your new position. We will speak when we are back in the Sanctuary." As soon as you accept the Night Mother's proposal, both you and Arquen will be sent to the empty Sanctuary in Cheydinhal.